It only takes basic building skills to construct a buffet table for your entry hall or living room. In a few simple steps, and some supplies from your local home-improvement store, you can build a buffet table that's 37 inches long, 18 1/2 inches deep and 34 inches tall. Lightly sand all wood pieces with a light-grade paper. Remove the sanding debris with a tacky cloth. 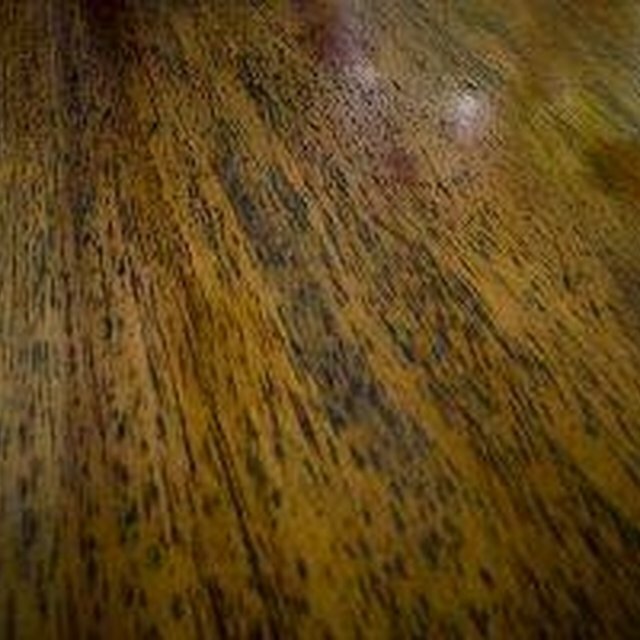 Apply a thin coat of polyurethane to one side and the edges of both wood panels, the decorative trim and the table legs. Let the polyurethane dry. Flip the cherry panels and the legs over and add a coat to the other side. Let it dry. Continue applying coats of polyurethane until you achieve the finish that you like. Lay the four table legs on a flat surface. Attach the "L" brackets to the top of each leg. Place a bracket on a leg and mark the spots for the screws. Drill pilot holes on these marks, and insert the screws to attach the bracket. Measure 18 inches from the top of each leg and place another "L" bracket--directly under the top bracket. Drill pilot holes before inserting the screws as you did in Step 2. Lay one of the cherry wood panels face down on a flat surface. Attach the "L" brackets at the top of each leg to each corner of the panel. Flip the buffet table so that it stands upright. Attach the remaining cherry wood panel onto the four lower "L" brackets. Place the buffet table on its back. Run a bead of wood glue along the front edges of each wood panel. Place the decorative trim onto the glue and secure it with finishing nails, placed about every 6 inches. Roll the table over and add trim to all four sides. Wipe off any excess wood glue. Add cherry wood putty to the nail holes and let it dry. You can build your buffet table with any kind of hardwood. Stain or paint the table to suit your home's décor. Wear safety glasses when cutting or drilling wood.